Following on the topic of growth and inclusiveness, here is a piece by Simon Romero from the New York Times. Romero visited Asuncion in April during the elections and wrote a few pieces about the country and many of its pressing issues which have been extremely helpful in raising the profile of Paraguay in international media. In this particular piece he looks at growth, economic development and those left behind. ASUNCIÓN, Paraguay — Walk into the headquarters of the central bank of Paraguay, a sprawling seven-story structure surrounded by flowering silk floss trees, and the message is clear: officials proudly display charts showing a dizzying economic boom, with growth reaching 13 percent this year, making Paraguay the fastest-growing country in the Americas. But just a few minutes away by car one recent morning, grandmothers waded through raw sewage in the labyrinthine slum of La Chacarita, scavenging copper wire and aluminum cans to sell at scrap yards. Indeed, Paraguay’s economic boom, fueled by bountiful harvests of export commodities like soybeans and corn, exists only in pockets. In parts of Asunción, showrooms are selling out of Porsches and Audis, and cranes are putting the finishing touches on luxury towers like the Ícono, a 37-story skyscraper of SoHo-inspired lofts. Yet much of the country, which has long figured among South America’s poorest and most unequal nations, remains left behind. More than 30 percent of the population lives in poverty, according to the central bank, and Paraguay ranks near the bottom among South American countries in reducing poverty over the last decade, according to the United Nations. Social spending for antipoverty projects is minimal, largely because taxation is lacking. Paraguay did not even have an income tax until this year, but even though the new across-the-board rate is low, at 10 percent, few people are expected to pay it, as exemptions and loopholes abound. The result: the economic boom may be accentuating the festering inequality in one of Latin America’s most politically unstable nations. Paraguay is a landlocked nation about the size of California, sandwiched between southern Brazil and northern Argentina, with a population of 6.5 million. About 77 percent of its arable land is controlled by 1 percent of the nation’s landowners, according to the last agricultural census, and land disputes simmer in various parts of the country. Activists claim that for decades large tracts of land were illegally distributed by corrupt officials, leaving many land titles in question. In one particularly bloody clash last June, 11 peasants and six police officers were killed at a soy estate in Curuguaty, in eastern Paraguay. Legislators seized on that episode as a way to oust Fernando Lugo, the former Roman Catholic bishop who was elected president in 2008, ending six decades of one-party rule. Mr. Lugo had initially been expected to focus on reducing inequality, but faced obstacles in doing so. Paraguay’s new president is one of the nation’s wealthiest men, the tobacco magnate Horacio Cartes, who was elected Sunday after promoting conservative, business-friendly policies during his campaign. He recognized poverty as an issue but has been vague about any plans for reducing it beyond trying to create more jobs through private investment. The government’s economists remain bullish about growth, arguing that Paraguay, devastated by a 19th-century war that wiped out most of its male population and ruled throughout much of the 20th century by Gen. Alfredo Stroessner, one of the world’s longest-ruling dictators, is emerging from decades of ostracism in the global economy. Paraguay sold $500 million of bonds in January in international markets, a rare source of financing for a nation overlooked by many foreign bankers for decades. Inflation and unemployment remain low, at less than 2 percent and less than 6 percent, respectively, and the overall poverty rate has fallen to about 32 percent in 2011 from 44 percent in 2003, said Roland Horst, a board member at the central bank. “We do have a peasant issue now and then,” Mr. Horst said in an interview. “But there is less tension than 10 years ago.” He said the government had been trying to reduce poverty, noting that a program of giving small cash stipends to people in extreme poverty, begun in 2005, now included more than 75,000 families. Other economists, however, dispute such sunny assessments, arguing that the economy remains subject to wide swings, surging this year thanks in part to favorable weather conditions for certain crops, after contracting slightly in 2012 when farmers struggled with a drought. They also contend that Paraguay’s social welfare programs remain meager compared with antipoverty projects in neighboring countries, which have lifted tens of millions of people out of abject living conditions. They blame Paraguay’s relatively weak state, with tax collection corresponding to only about 18 percent of gross domestic product, a figure lower than that of African nations like Congo and Chad. “The statistics showing historically low unemployment are a farce,” said Luis Rojas Villagra, an economist at the National University, who estimates that as much as half of Paraguay’s work force is unemployed or underemployed in jobs with degrading wages and working conditions. “How is it possible to reconcile the fact that hundreds of people survive each day by sifting through garbage in the municipal dump of Asunción while Paraguayans are also the biggest per-capita spenders in Punta del Este?” said Mr. Rojas Villagra, referring to the Uruguayan resort city where rich Paraguayans vacation alongside moneyed Argentines and Brazilians. 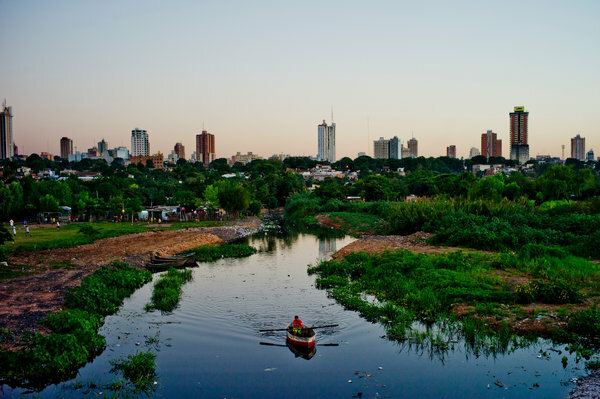 Such contrasts persist across Paraguay’s economy. Pockets of luxury, for instance, are expanding near Ciudad del Este, the city on the Brazilian border renowned as a smuggler’s haven. One development, the Paraná Country Club, includes mansions selling for more than $3 million, largely to soybean growers or business executives from Brazil who have opened factories in Paraguay, a migration of manufacturing that is starting to resemble that of companies from the United States opening factories in low-wage Mexican border cities. “2013 is starting to look like an amazing year,” said Thelma Amaral, an architect who designs homes near Ciudad del Este. But elsewhere, including the soybean regions at the root of the growth, examples abound of disparities and disputes, largely over land. A small leftist rebel group, the Paraguayan People’s Army, has been picking off security forces in remote areas. Last weekend, the group killed at least one police officer and wounded several others. In December, gunmen shot dead Vidal Vega, a leader of the peasant movement involved in the deadly clash at Curuguaty. He had been expected to be a witness at the criminal trial intended to shed light on the massacre. The inquiry into his killing, as in similar cases of peasant leaders killed in Paraguay in recent years, has turned up few leads.